Are you looking for cheap garden supplies for your home or business? You’ve come to the right place. Finding the right supplies that fit your particular needs is not always an easy task. A lot of vendors out there sell supplies, but do they have the products in stock that you need, and can they get them to you when you need them? These are all questions that you need to consider. Let’s first start with a little background on the products themselves, so you know what questions to ask before you make a purchase. Flower Pots: Whenever one thinks of cheap garden supplies, flower pots are always the first thing that comes to mind. Sure everyone knows what flower pots are and how to use them, but you would be surprised at how many people do not realize how many different options there really are, or how much thought goes into their design. The first two things to consider when buying a pot is how big of a plant is going into the pot, and how long do you intend on keeping it in the pot? Now this may seem like common sense, but these are two of the biggest mistakes customers make when ordering their discount garden supplies. Flower pots come in an insanely large number of options, so it’s best to know those options before making a choice. 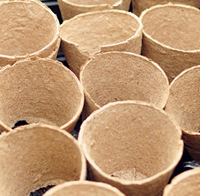 Peat pots and pellets are some of the most popular cheap garden supplies on the market today. Any supply company will tell you, customers love these items! There are many factors that contribute to this adoration. Ease of use is probably the most common. The pots are pre-formed, so you just fill them with your favorite potting soil and you’re ready to go. Because peat pots are biodegradable, much of the guesswork is removed from the transplanting process. There is no need to remove the plant from the pot when it is ready to be transplanted, you simply bury the peat pot or pellet right into the ground with the plant. As the pot degrades, it even adds nutrients to the soil. This helps to eliminate transplant shock which every gardener appreciates! Peat pellets function much the same way as the pots, the only difference is no potting soil is required. These discount garden supplies are shipped in compressed little disks and only need soaked in water for a short amount of time to be used. They are typically manufactured with their own netting wrap, so once expanded the peat does not break apart. These products have come to be known by many names, seed trays, propagation trays, plug trays, and more. Whatever you choose to call them, their function is the same, to start large amounts of plants in as small a space (also known as footprint) as possible. Standard seedling trays are called 1020 trays, which is a rough indication of its measurements, but the name is also a little disingenuous. These discount garden supplies are typically manufactured to be 10.5” wide by 21” long. Trays that ACTUALLY measure 10” x 20” are called TRUE series trays, be careful when ordering or you may end up with incompatible products. Another factor to consider when ordering seedling trays is durability. Don’t be afraid to pay a little extra for a heavy duty tray if you intend on reusing them season after season. Economy trays are designed to be used once and done, that’s why they are sold so cheaply; don’t let anyone tell you differently. If repeated use is what you’re looking for, search for plug trays. You will pay a little extra for them, but they will last for several seasons with proper use, and in the end these cheap garden supplies will more than pay for themselves. Square Pots versus Round Pots: This is a common question that comes up when trying to decide which style pot to buy. Should you go round or square? The answer is deceptively simple…it is entirely a matter of personal preference! The plant really doesn’t care what shape the pot that holds it is. Now that said there are a few practical differences, but they are minor in the grand scheme of things. A square pot of the same diameter will actually hold more soil volume than a round pot because of the corners, giving the roots more material to grow into. Square pots will also fit snugly beside one another on the bench, reducing water and fertilizer waste. This cramped condition however also hinders airflow, which is an extremely important factor in close quarters growing. Some customers will prefer to use square pots, but then they space them out on their benches to allow for adequate airflow. The argument could be made that a round pot might solve that problem, and reduce the amount of soil used in the process. Again, no matter which of these discount garden supplies you choose, it all comes down to personal preference in the end. A nursery pot is a term generally reserved for the larger containers that you find trees and shrubs grown in at your local nursery. These discount garden supplies are generally produced in black only, and while they are not terribly stylish, they are extremely flexible and durable, and well suited for the types of plants grown in them. 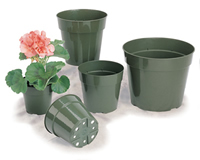 These pots are produced in sizes as small as a quart, and sizes all the way up to 55gal. The most commonly used nursery pot by far is the one gallon pot. This versatile pot is roughly half a gallon in volume and makes for a great transitional pot. You can transplant starters right into these pots and then grow them for many weeks before moving them into your garden. The larger soil capacity of nursery pots makes them invaluable tools that you’ll find in every greenhouse across the country.